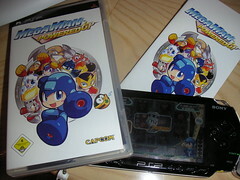 Today I got my copy of “MegaMan Powered Up” for the PSP, a remake (and extension) of the original MegaMan 1 from back in the 1980s. Extension because the game has a completely fresh look (more cute characters and not as serious as MegaMan X), the original levels got redesigned, there are new levels and new bosses and a level editor. There is also a classic mode available which contains the original MegaMan levels (but with the new engine) … at least I think those are the old levels since I’ve never actually played MegaMan 1 or can’t remember it. If you like mini-levels there’s also a challange mode, where you simply have to reach the goal according to the rules of the respective level. Yet another bonus is, that when you defeat a boss in the main mode (the one with the redesigned levels) by only using your original weapon, the your former friend doesn’t get killed and Dr. Wight is able to repair him :) Now you can use him as an alternative character in the main mode.